The Emperor penguin (Aptenodytes forsteri) is the heichest an hiviest o aw livin penguin species an is endemic tae Antarcticae. The male an female is seimilar in plumage an size, reachin 122 cm (48 in) in heicht an weichin onywhere frae 22 tae 45 kg (49 tae 99 lb). The dorsal side an heid is black an sharply delineatit frae the white belly, pale-yellae breast an bricht-yellae ear patches. Like aw penguins it is flichtless, wi a streamlined body, an wings stiffened an flattened intae flippers for a marine habitat. Its diet consists primarily o fish, but can include crustaceans an aw, like krill, an cephalopods, or like squid. In huntin, the species can remain submerged up tae 18 meinute, divin tae a depth o 535 m (1,755 ft). It haes several adaptations tae facilitate this, includin an unuisual structured hemoglobin tae allou it tae function at laich oxygen levels, solid banes tae reduce barotrauma, an the ability tae reduce its metabolism an shut doun non-essential organ functions. 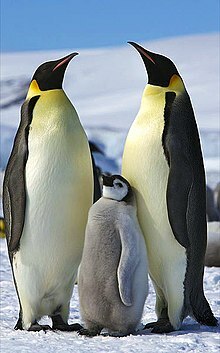 The Emperor Penguin is mibbe baist kent for the sequence o joorneys adults mak each year in order tae mate an tae feed their affspring. The anly penguin species that breeds in the Antarctic winter, it treks 50–120 km (31–75 mi) ower the ice tae breedin colonies whilk mey include thoosands o individuals. The female lays a single egg, whilk is incubatit bi the male while the female returns tae the sea tae feed; parents subsequently tak turns foragin at sea an carin for their chick in the colony. The lifespan is typically 20 years in the wild, though observations suggest that some individuals mey live tae 50 year o age. Wikimedia Commons haes media relatit tae Aptenodytes forsteri. Roscoe, R. "Emperor Penguin". Photo Volcaniaca. Retrieved 13 April 2008. This page wis last eeditit on 16 Februar 2018, at 04:14.